From 1954 to 1978 the field was used by the Society for Sports and Technology (Gesellschaft für Sport und Technik, GST). 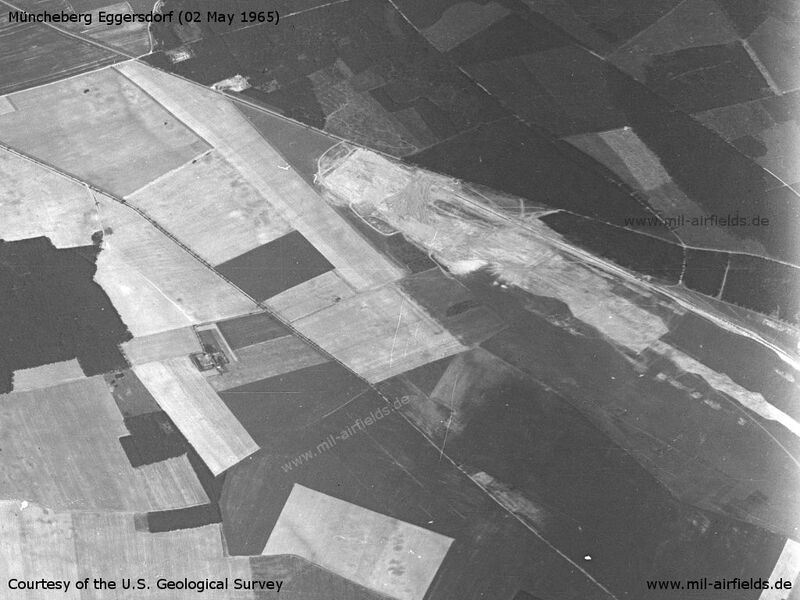 From 1965/66, airfield of the East German National People's Army (NVA), initially shared with the GST, from 1978 exclusively auxiliary airfield of the NVA for Fighter Wing 8 (Jagdgeschwader 8, JG-8) and Transport Wing 44 (Transportfliegergeschwader 44, TG-44), both based at Marxwalde airfield. 1. 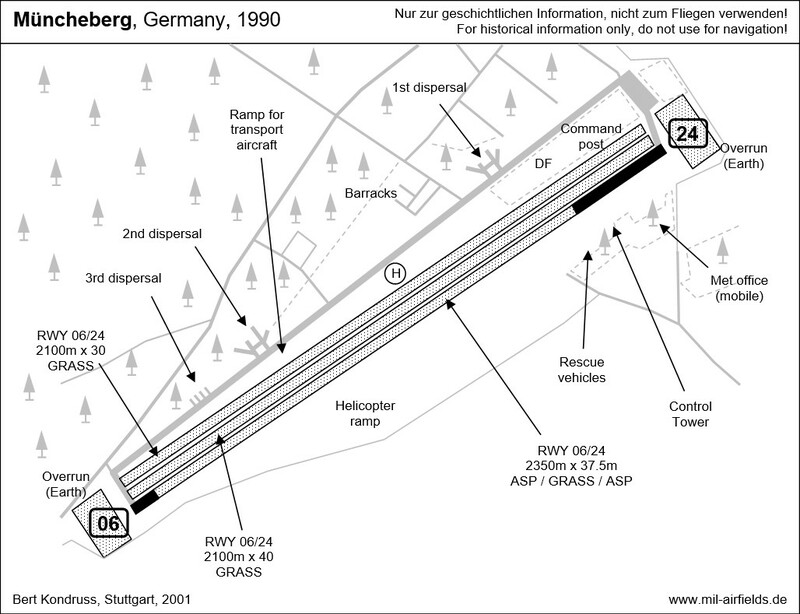 Muencheberg airfield is located within a triangle formed by Muencheberg (N52/V55), Eggersdorf (N53/V34) and Schoenfelde (N53/V24), in Brandenburg. 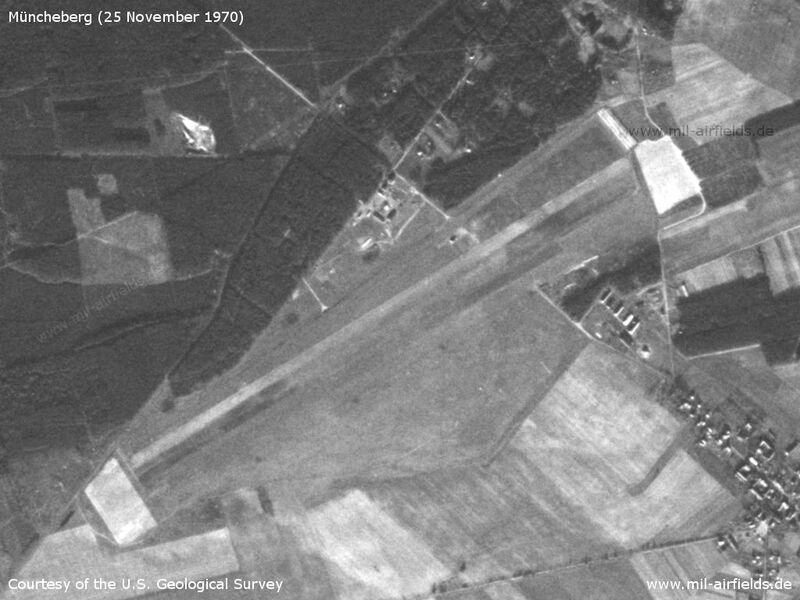 It was formerly used by the German Luftwaffe and presently servers as an auxiliary airfield for the Soviet Air Force. The field is not suitable for jet aircraft. 2. 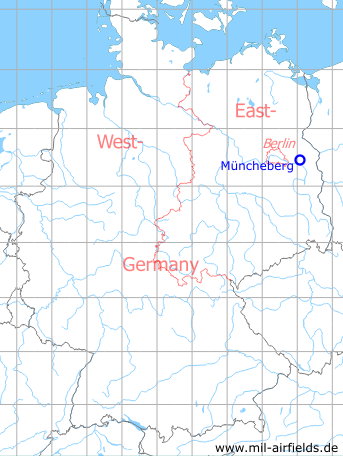 Approximately 500 Soviet Air Force personnel are stationed at Muencheberg airfield. There are no permanently stationed flying personnel. 3. The prevailing wind over the field is east-northeast to northeast. There is a grassed runway. Lanterns serve as emergency lighting for night flying. 4. There are no permanent buildings at the field. A camouflaged dispersal area for aircraft and ten new huts were being prepared in March 1950 and were due to be completed by autumn 1950. Construction was being carried out by Soviet army units stationed at the airfield. 5. There is a direction-finding device at Muencheberg. 6. Fuelling is carried out from drums or tank trucks as there are no permanent fuel tanks at the field. 7. ... one or two visiting aircraft were in the air over the field each day. There is a landing-ground near the village of EGGERSDORF south of MUENCHEBERG. This landing-ground ... is used for glider training of GST members. Four gliders are stationed at this landing-ground, together with two small single-engined aircraft used to tow the gliders. There is one small hangar shed for the gliders. There are no installations at this airfield, no new construction, no concrete runway or other airfield equipment. The call sign was MESSING.